These are odd dye lots, ends of custom orders, or just really good deals that I wanted to pass on to you. All of these items are short inventory! 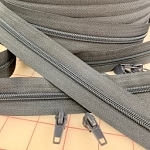 #3, #5, #4.5: These are STANDARD coil zippers. The number (3 or 4.5 or 5) is the mm across the closed coil. So a #3 is 3mm across the closed coil. Use this size for light weight fabrics. Use in small pouches, pillows, duvet covers. 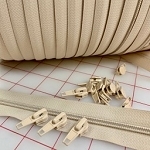 #5 or 5mm is a heavier weight zipper used in slipcovers, upholstery, outdoor cushions, window seat cushions, boat cushions and the outside of purses, duffle bags, totes. #4.5 or 5mm is between #3 & #5. Many folks call these handbag zippers. My preference is for #5 which is a much stronger zipper which can be opened & closed frequently. Below I have several 4.5mm zippers as separating zippers which work on sweaters for kids & medium weight yarns. #5 MOLDED: Below are numerous #5 MOLDED separating or jacket zippers. They are 5mm across the closed plastic teeth. They work great on most jackets, and also for duffle bags & purses. Easily shortened from the top for most projects. As we get more busy, I don't get a chance to answer the phone...... please text me or email me. Many days I don't get to emails until the end of the day so be patient! When I am on the road, Cass or Acacia or Vanessa will be answering the phone. #5 Coil: 25 yds/40 LONG pulls Buy 5 & Get 1 FREE! TAN #5 Zipper - 25 yds.